This course series is currently in development and is part of a collaborative effort by NCAR's Earth Observing Laboratory, Millersville University, and The COMET Program. Completed lessons are currently available on MetEd and accessible below. 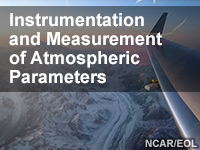 The course focuses on the science involved in measuring basic atmospheric parameters. This information can help with successful instrument siting and data collection for various efforts. Learners might also want to explore the 3D Printed Automatic Weather Station (3D-PAWS) initiative, which is expanding atmospheric instrumentation and real-time monitoring capabilities to sparsely observed regions.